R on Target 6964 was Rausch's top selling bull. Location: at the ranch near Hoven, S.D. Rausch Herefords is truly a family outfit. Brothers Vern and Jerry along with Vern's sons Shannon and Joel, and others bearing the Rausch name work together to raise the kind of Hereford cattle with the EPDs and data that the industry is looking for. These cattle don't all stay in South Dakota. One load of heifers found a new home in Virginia. The top selling bull of the day was lot 50. The youngest bull in the sale, the goggle-eyed son of Hyalite On Target 936 boasted a YW EPD of 112, REA of . 71, and ratiod 128 on REA, 108 on IMF, 124 as a yearling and 113 at weaning. He sold to CK Cattle Company of South Dakota and Jenson Brothers of Kansas for $60,000. The bull's dam, out of MSU TCF Revolution 4R, is the "pick of the herd" and will sell in Denver this year. Lot 73, a 2-year-old, went home with Dennis Poss of Nebraska for $14,000. Another goggle-eyed individual, this bull weighed 1,850 on sale day, had a 41 scrotal circumference and 32 Milk EPD. WRK Hereford Enterprises LLC of Nebraska liked Lot 18 enough to make him one of the third highest sellers at $10,500. With a -1.6 BW EPD, and 73 pound actual BW, the Rausch family said this March, 2014 calf should make a heifer bull. The bull's 2-year-old mother did it right, and the yearling posted a 1,000 pound sale-day weight and an impressive 27 Milk EPD. Four more bulls were valued at $10,500 that day. All were 2-year-olds. 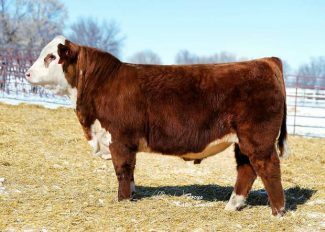 Lot 95 went to Hall Herefords, Colorado. Lot 52, out of the same sire as the top selling bull, went to Greg Haukaas, South Dakota. That bull's dam has three daughters and one son working in the Rausch herd. Lot 75 went to Herman Kauk, South Dakota. Lot 79 went to Mark Fleer, Jr. of Nebraska. Raap Hereford Ranch of South Dakota bid $13,500 to own the top-selling heifer, R Miss Bonanza 134. With a -.3 BW EPD and WW EPD of 62, YW EPD of 98 and a 26 Milk EPD, it was hard to ignore the numbers on this girl. The hospitality at this place is impressive. The family served steak sandwiches to the huge crowd before the sale. The crowd stayed busy bidding on this beautiful February day, and the sale report reflects the buyers' interest and attention paid to the cattle in the pens and the video screens during the sale.